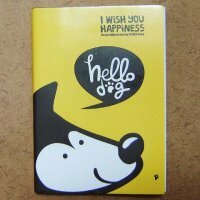 Hello Dog Cute Small Notebook Planner ,Note Pads, Stationery : Starscastle Online Shop: Cute Bags, Accessories, Kawaii Stationery, Cool Wallets, Fashion Jewelry & More! Super kawaii small notebook planner - in handy travelling size! Collect all Hello Pig and Monkey notebook series to make a set!